When I began thinking about writing, I had a dream that I could someday reach out to the world and educate them with my writing. I wanted to be like Siddhartha Mukherjee, the author of one of my favorite books, The Emperor of All Maladies: A Biography of Cancer, who is both an oncologist and an award-winning science writer. I took my chances. About half of the topics were exactly what I’d hope to write on (those most related to medical sciences) and half were not. Turns out, my professor picked exactly what I didn’t want to write about. When I looked at the book list for the course, half of them were about studying wolves in nature and the other half gorillas. Not only were we not focusing on topics I wanted to write about, we were barely even writing. Instead, we were reading science writing books. Nonetheless, I bought the books and started going to the classes. My professor was a cute old woman with a soft voice and long graying hair who loved to get side tracked and tell us stories about her day. At first, I was frustrated with her taking away discussion time, but I grew to love her stories. In one of these stories, prior to beginning discussion on the first book we were reading, she mentioned she was teaching another class, “Science Writing for Popular Audiences.” BINGO. I found my class. Though I didn’t have the writing course prerequisite, I explained to her my desire to actually write and my background in science that compelled me to do so. Without hesitation, she let me switch courses. Just a few weeks into the semester, I found myself walking into my first Science Writing for Popular Audiences class and surprise, surprise, our first topic to write about was the wolves of Isle Royale. Clearly, this professor had a liking towards wolves. This time, though, instead of reading about the wolves, I had the chance to write about them. Our prompt was to research the wolves and write an article that would explain to the reader the current dilemma the wolves on this island faces. 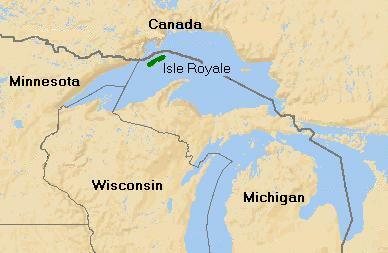 If you don’t know, Isle Royale is a small island in Lake Superior, just 20 miles from the mainland. It is inhabited with moose, loaded with fir trees, and in 1949, two grey wolves crossed an ice bridge from the mainland and started a wolf population on the island. It is also home to the longest running closed system predator-prey study. If you’ve ever learned about population dynamics (you may have to think back a ways – I can recall making mathematical equations to represent it in my high school math classes), the data for the basis for understanding the fluctuation of predator and prey likely came from this island. Over the more than 50 years of this study, the wolf population has fluctuated along with the moose, reaching a maximum of 50 in the late ‘70s. This fluctuation was thrown off soon after that peak as a virus killed of many of the wolves. Ever since, the pattern of rise and fall no longer fit our expectation from the first half of the study and today, the wolf population is the lowest since the study began. What seemed like a simple task – write about the wolf population – was much more difficult than I could have ever imagined. I had so much that I wanted to write about this island, rich in history, and the shrinking wolf population that there was no way I could fit it all into 750 words. My first edition of my paper, to say the least, was atrocious. Used to writing reports and simply telling like it is, I was not the greatest at turning information into a story. Luckily, my professor gave me a second shot. I took a step back and looked at my paper, cutting nearly all of it. No, I didn’t need to spend half of it talking about the history of the study, the fluctuation of the wolves; I needed to talk about here and now. 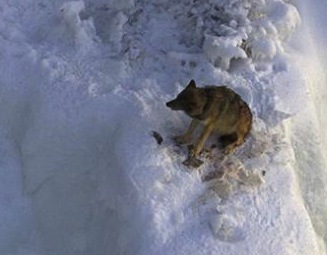 I also decided to take a different angle, to give an overall story of the situation the wolves are facing, not the issue the researchers are facing looking at the wolves. After much rewriting, I ultimately came up with a piece I was proud to call mine, Isle Royale’s Drama of Survival. Most importantly, during this process, I went from hating that I had to write about wolves, to loving these wolves. Living close to Lake Superior, I wanted to take a trip to the National Park on the island to see where the wolves live. I obsessively kept track of the researcher’s blog as they did their winter survey. I was scared every time I checked it to see if Isabelle, a lone wolf on the island and one of the only remaining females, had been killed by the pack that was pursuing her. When the study of 2013 was done and updates were no longer given, I continued to think of Isabelle. Isabelle cornered following an attack. I was excited to hear that she was seen again on the island this winter. The researchers last saw her on January 21st, heading toward her assailants. There have been a few ice bridges formed to the mainland this year, the kind of bridges that brought wolves to the island, but that can also let them leave. The researchers believe she left the island via ice bridge that night. She made it… her carcass was found on the mainland on February 8. Today, I mourn the loss of Isabelle but also have hope for the island. Three pups were born this year, the first pups for some time. Yet, the issue of inbreeding remains and the debate to intervene continues. Nonetheless, I’m glad I stuck with this class despite lack of appeal a wolf study originally had to my medically-oriented self. I learned to become a better writer, wrote my first science writing piece, and I was introduced to these wolves who will always have a special place in my heart. News of the passing of Isabelle is in todays Tribune. There are many editorials about the article. Most favor just leaving things to play out. One wants to introduce rabbits and deer. One suggests introducing Polar Bears…. NICE WRITTING!